The weekend of June 17/18th marked a pretty remarkable event in Berne, NY. 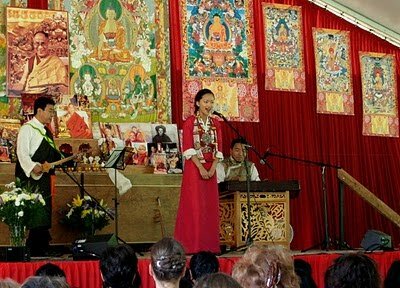 On a piece of land where previously there was nothing, a group of almost 500 Rigpa students, local residents from the area of Berne, and Tibetan and Himalayan people came together to attend the inauguration of the Tenzin Gyatso Institute (TGI). TGI is a new center dedicated to bringing the ancient wisdom of Tibetan Buddhism in the modern world, and to making it live on. The day was marked by celebrations, uniting three different flavors: Tibetan culture, Western science, and its connecting bridge, the Buddhist teachings. find inner peace and contentment, which is the source of happiness. All we have to do is to remember to turn our mind inwards. It was wonderful to see how, maybe for the first time, large groups of Tibetan and Himalayan people came together with dedicated Western students of Buddhism, united under the wish to preserve this "ancient wisdom for the modern world."